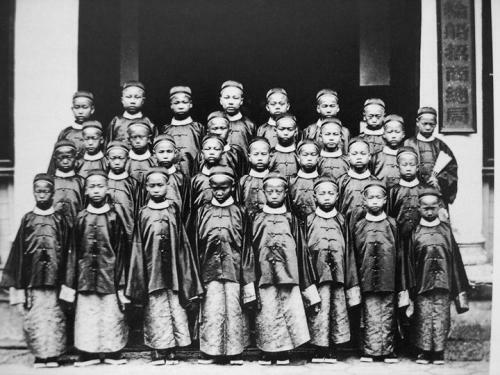 Thirty CEM boys photographed prior to departure in front of the China Merchants Steam Navigation Company in Shanghai. Though often identified as a group photo of the First Detachment before departing in 1872, the company name shown on the Chinese signpost at right was officially adopted only on August 7, 1873, after the departure of the Second Detachment. Hence this group must have been either the Third or the Fourth Detachment.